Having trouble downloading an updated version of your plan? Think whole data lifecycle- during your research you may have different types of data, with different formats. e.g. 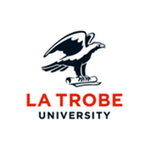 We will store on the La Trobe Research Drive; The survey will be done using Qualtrics; Audio recordings using my Android device; Physical data will be stored on Room 206, Building HS1; Anonymised and pooled data will be shared on Figshare; All data will be deleted after seven years in consultation with ICT. Having trouble accessing the planning tool? Use this blank plan here. Enter the title of your research project. Outline the purpose and intent of the research project. Indictate whether the project is a "Research project" or a "Higher degree by research project". Indicate whether the research is externally funded. If applicable, start typing any text from your grant code or title, then select from the list provided. 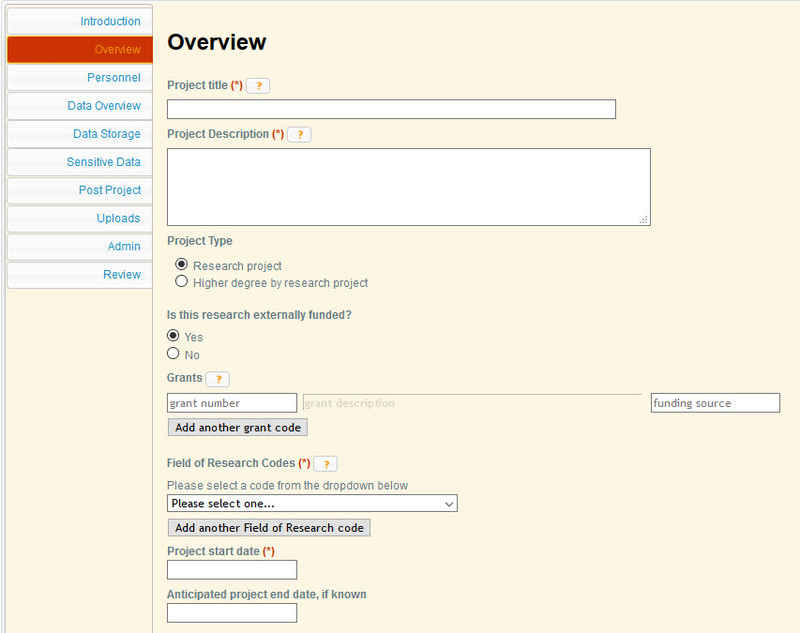 Select the Field of Research code(s) associated with your research project. Information on the Fields of Research classification codes can be found at http://www.arc.gov.au/rfcd-seo-and-anzsic-codes. Ensure all people listed on your Ethics application are also listed on this form. To add people to your project, click on the "Add project personnel" button. Note that you can only add one person at a time. A search box will open, allowing you to search by either name or email address. Click on "Select" next to the name you want to add from the results list. The Chief Investigator associated with this research data. The Chief Investigator is the researcher who takes the lead role in the conduct of the research project. Those who will supervise this research. This 'supervisor' field will be relevant where the research is being conducted by a research student. The research supervisor is responsible for general oversight of an academic research project. The owner of the data. This might be particularly pertinent when (re-)using someone else's data. The person who will be responsible for managing the research data produced by the project. Collaborators may contribute to the project for some or all of its duration or they may make frequent or substantial contribution. They may be responsible for one or more of the main elements of the research or a key step in the research. Collaborators generally exclude those who make only an occasional or relatively minor contribution to the research or those not see as researchers (e.g. technicians and research assistants). Someone who needs to be able to view the data, but not analyse or use it in another way. If you're collaborating with non-La Trobe staff or students, check the box next to "Will you be working with external collaborators (non-La Trobe University)?" Two free-text fields should then display underneath for "Name" and "Affiliation". Enter the relevant information in these boxes. Note: you don't need to assign roles to external personnel. The "Data Overview" section covers information about data generation and access. Depending on which radio button you select, the questions on the page will change. How will you generate the data? Be specific and list survey tools, machines, platforms, hardware, and software. e.g. We will conduct semi-structured interviews using either video cameras owned by La Trobe or Zoom. We will also conduct a qualitative survey using Qualtrics. During your project, how will you provide access to the data to others outside La Trobe who require it for collaboration, commercial, contractual or other reasons? Include: External collaborators, staff at external institutions who may be collecting / processing data (e.g. hospital staff), and external services such as transcription agencies. For this question, Include location of physical keys, passwords, other devices necessary to access data, and any relevant indexes or catalogues. DO NOT PUT YOUR PASSWORD IN THIS FORM. e.g. Access to potentially identifiable data will be provided ONLY to the collaborators mentioned in this application, and will be via the CloudStor FileSender tool. Access to external researchers not mentioned in this application will ONLY be to deidentified data after the project has concluded. How will you ensure the data is accurate, complete, authentic and reliable? For this question, consider approaches such as monthly lab meetings to review progress and issues, review of all data by the chief investigator, peer review process, use of data only from researchers with whom you have previously collaborated. If you select "both generating data and using existing data", you'll be asked all of the questions above. Will you store any research data on personal equipment? 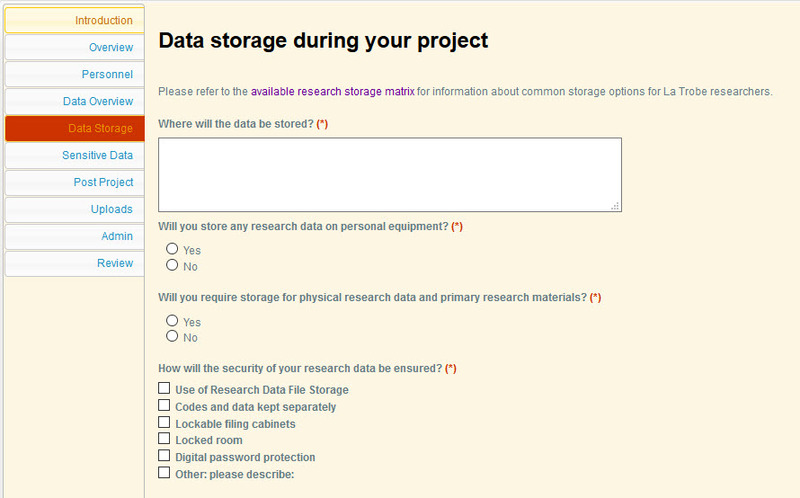 Will you require storage for physical research data and primary research materials? How will the security of your research data be ensured? 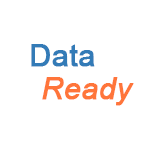 For more information about data storage, see the Data Storage guide on Data Ready. In the "Sensitive Data" section, you need to consider whether your research project is working with sensitive or identifiable data. Measurements may potentially identify participants. Surveys may contain information that in context could be used to identify individuals or groups. For example, someone could be identified by combining their age, their location, and occupation. Transcripts of interviews may contain specific qualitative information that could identify an individual. Note that any research involving human participants, their data or tissue requires human ethics review. Check whether human ethics approval is required. Contact the University's Industry Engagement team for assistance. Information about Aboriginal or Torres Strait Islander people. See the AIATSIS Guidelines for Ethical Research in Australian Indigenous Studies. Information controlled under the Defence Trade Controls Act (2012). See the University's Data export controls page for further information. Other: text box to describe. What extra security measures will you take to protect your sensitive research data? See the Data Ready Sensitive Data guide for further information on managing sensitive data. In the "Post Project" section, you need to consider what will happen to your data once the research project has finished. Additional information is provided within the form. Ensure the information here is consistent with participant consent forms and other sections of the Human Ethics application. Archiving your data on managed storage can protect it for the long term. Archiving your data can also enable managed or open access to the data if appropriate. Destruction of data can be a requirement of some ethics approvals. 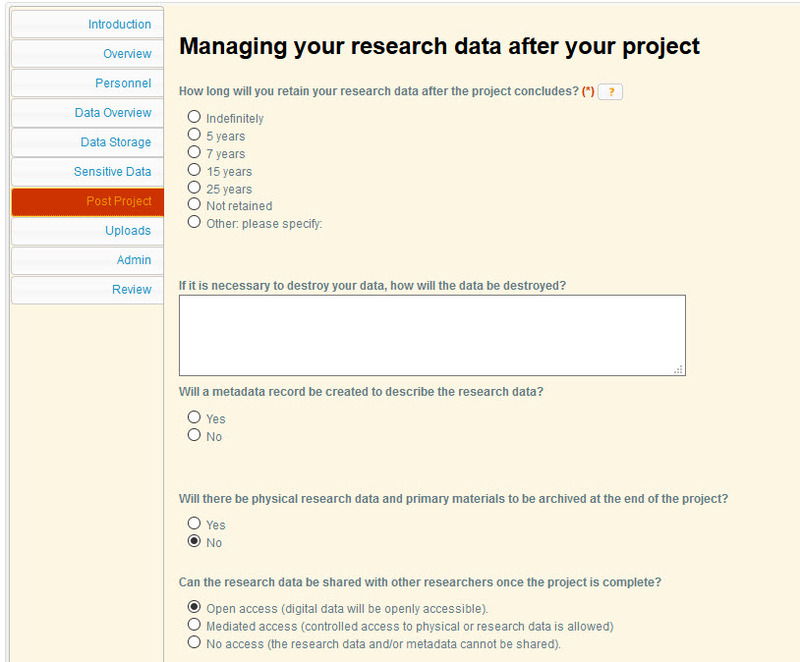 How long will you retain your research data after the project concludes? Note that Information about record retention periods can be found at Section 4, Part H of the Research Data Management Procedure. How will the data be organised after the project concludes? If you plan on making your potentially identifiable or sensitive data open access, please state that you will anonymise your data for sharing. For more information about metadata and its purpose, see the Data Organisation guide on Data Ready. Be specific about the drive or platform For more information about data storage, see the Data Storage guide on Data Ready. Will a metadata record be created to describe the research data? A metadata record is a guide that informs project personnel and/or secondary users about project methods, data collection and data preparation, including details of specific data fields. Can the research data be shared with other researchers once the project is complete? Open access (digital data will be openly accessible). If you select this option, ensure you have stated that potentially identifiable data will be anonymised under the question How will the data be organised after the project concludes? Mediated access (controlled access to physical or research data is allowed). No access (the research data and/or metadata cannot be shared). For more information about metadata and its purpose, see the Data Publication guide on Data Ready. Will there be physical research data and primary materials to be archived at the end of the project? If you answer "Yes" to this question, you'll be asked where the physical research data and primary materials will be archived. Be specific and list room numbers / buildings. If it is necessary to destroy your data, how will the data be destroyed? 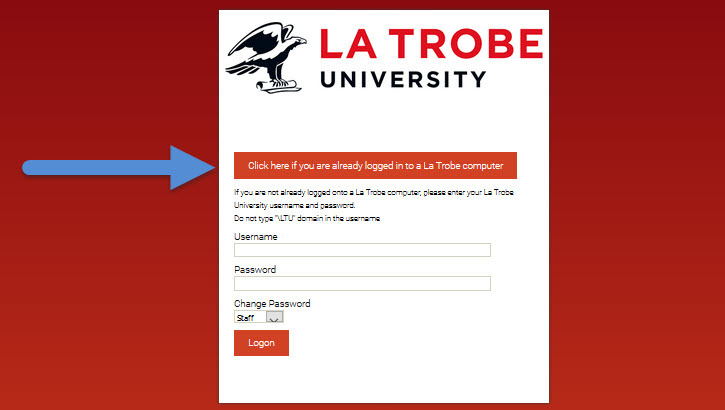 Be specific and ensure you state that you will abide by the requirements of La Trobe ICT and Records and Archives. For more information about the safe and secure destruction of data, see the Secure Destruction page on the End of Project guide on Data Ready. The "Uploads" section gives you the option of uploading additional documents which you believe should be retained with this research data management plan. The file name and description you enter will be recorded in the table at the bottom of the page.